From the minute they tour our three ceremony sites, outdoor tented pavilion and renovated historic house, Philadelphia couples can’t help but share their joy. To have these 300 serene acres with modern amenities and experienced professionals so conveniently located is a huge asset to the Philadelphia wedding community, and the good word is spreading fast! Maybe it was the exceptional service the couples enjoyed at Springton Manor Farm that inspired them to leave rave reviews on WeddingWire. Or maybe it was hearing from their guests, who savored every bite of their custom menu among relaxing farmlands. 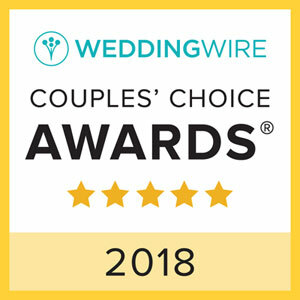 Most likely, it was the complete Springton Manor Farm experience that placed us among the top 5% of vendors on WeddingWire—gracing us with its highly coveted Couples’ Choice Awards. If you too would like to race your wedding dreams around in one of our golf carts with our experts by your side every step of the way, contact us online or give us a call at 610.733.2516.